Just before Election Day, I’d like to add a bit of political humor to lighten things up. If you haven’t heard about the “Two Cow” Philosophy of Government, I hope it will bring a smile to your face. It’s a fun, irreverent way to learn the major forms of government. I don’t know who came up with the original idea, but there are a lot of versions out there (like The Two Cow Philosophy of Government, Political Philosophy 101, and Politics Made Easy) and many people have contributed their own ideas. It may have started as a joke, but the best jokes have an element of truth in them. * Anarchy: You have two cows. Either you sell the milk at a fair price or your neighbors try to kill you and take the cows. * Communism: You have two cows. The government takes them both and provides you with milk. * Democracy: You have two cows. Your neighbors decide who will get the milk. * Democracy, American Style: You have two cows. The government taxes you to the point that you must sell them both in order to support a man in a foreign country who has only one cow which was a gift from your government. * Dictatorship: You have two cows. The government takes both and shoots you. * Fascism: You have two cows. The government takes them and sells you the milk. * Feudalism: You have two cows. The lord of the manor takes some of the milk. And all of the cream. * Socialism: You have two cows. The government takes one and gives it to your neighbor. * Totalitarianism: You have two cows. The government takes them and denies they ever existed. Milk is banned. * Bureaucracy (Not a government philosophy by itself, but it’s like death and taxes): You have two cows. At first the government regulates what you can feed them and when you can milk them. Then it pays you not to milk them. After that it takes both, shoots one, milks the other, and pours the milk down the drain. Then it requires you to fill out forms accounting for the missing cows. * Capitalism: You have two cows. You sell one and buy a bull. * Capitalism, American Style: You have two cows. You sell one, buy a bull, and build a herd of cows. * Surrealism: You have two giraffes. The government requires you to take harmonica lessons. How many cows do you have? What do you want to do with them? “Act as if what you do makes a difference. It does,” wrote philosopher William James. 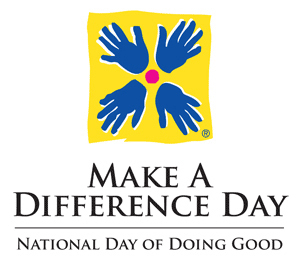 Saturday, October 27 is Make a Difference Day, a national day of community service. It’s a day to celebrate neighbors helping neighbors. It’s a day to work together to improve the lives of others. * Make a Difference for Homeless Keiki: A week early, Project Hawaii organized four days to make a difference in the lives of homeless keiki. They asked for volunteers to help at a donation drop-off site and donations of personal hygiene supplies, school supplies, and healthy snacks. But it’s never too late to volunteer. If you missed the drop-days, you can still volunteer to help with costume workshops, Christmas wishes, and Easter celebrations. * Make a Difference for Animals: On Friday, October 26, you may see students dressed up as animals and waving paws and signs outside their school! The Hawaiian Humane Society has encouraged Oahu students and teachers to show their support for the human-animal bond and being kind to animals. * Make a Difference at Hakipu‘u Stream: On Saturday, October 27 and Saturday, November 24, 8 am to noon, you can help clear invasive plant species from Hakipu‘u Steam in Kaneohe, Oahu. Hui O Ko‘olaupoko also plans to reforest with native plant species and install enclosure fencing to protect the reforested areas from domestic cattle and wild pigs. * Make a Difference at Hanauma Bay: If you enjoy spending time at the beach, talking with people, and learning about marine life in Hawaii, you can become an Interpretive Guide at Hanauma Bay in Hawaii Kai, Oahu! A volunteer training program starts on Saturday, October 27, and runs for four consecutive Saturday mornings. You’ll learn about reef ecology, fish biology and ID, marine protected species, park history, and more. Volunteers are asked to make a six-month commitment of one four-hour shift per week. If you’re planning a “Make a Difference Day” event or know of an event in Hawaii, please share it with us! “We must remember that one determined person can make a significant difference, and that a small group of determined people can change the course of history,” said writer Sonia Johnson. How will you make a difference today, tomorrow, and everyday? Who has made a difference in your life? Election Day is just two weeks away. I hope you’ve already mailed your ballots or are planning to stop by your polling place on November 6. Reading about the issues and watching the debates, I wondered what I would do if I were a State Legislator. It’s a tough job and I admire everyone who takes on the challenge. Our legislators have to represent their constituents while standing by their principles, reading thousands of pages of proposed bills and sitting through numerous hearings and committee meetings. Day 1: Create a nonpartisan unicameral legislature. There would be a single nonpartisan primary election, with the top two candidates competing in the general election. Each senator would have a four-year term, with half the seats up for election every two years. We would have smaller legislative staffs and budgets, less duplication of proposed bills, and more time for actual debate. Day 2: Submit a zero-based state budget. Every ten years, the state budget should be reset to “zero.” We would slowly build the budget, based on priorities and tax revenue, starting with essential services like public safety and security (police, fire, ambulance, coast guard), infrastructure (roads, highways, streams, harbors, airports), utilities, education. Day 3: Write a new income tax code. Let’s throw out the existing income tax code and start from scratch based on a flat tax, with few or no tax credits. Tax returns should be no more than two pages, and the entire tax code should be no longer than an elementary school textbook – and able to be understood by an elementary school student. Day 4: Repeal the General Excise Tax (GET) and replace it with a reasonable state sales tax. The tax would only apply to retail-level goods and services, excluding food and drugs. A sales tax would remove taxation at every step of production, eliminate the requirement to pay taxes on the taxes we pay, stimulate consumer spending and business growth, and lower the cost of consumer goods. Day 5: Reform state welfare and SNAP programs. We need to merge duplicate programs, eliminate ineffective programs, and share the best practices among all public service programs. Day 6: Propose an independent audit of the Department of Education (DOE), including the University of Hawaii system. We should focus on ways that technology can help us manage costs and simplify payroll. We should examine contracts and spending authority. We should give schools and principals more hiring and spending authority. Day 7: Establish legislation caps and rules. Enact limits on the number of new and revised bills that can be introduced in each legislative session. All bills should include estimated costs, funding sources, and a sunset date (no “automatic extension” clauses). At least five days of each legislative session must be devoted to the repeal of out-dated or ineffective laws and regulations. Someone once said, “The whole point of getting things done is knowing what to leave undone.” What would you do if you were a new legislator working with other newly sworn in legislators? Hill comes up with a pretty comprehensive list of questions, focusing on philosophy rather than specific legislation. The questions cover Political Philosophy and Governance, Economics and Taxation, Social Issues, and Native Hawaiian Issues/Akaka Bill. I think that 65 questions are overwhelming, for both candidates and voters, so I narrowed it down and came up with my own list. 1. Role of government: When there is a problem, would you first initiate government action [legislation, taxes] or first seek a way to encourage private action to address it? 2. Tax philosophy: Should government collect the taxes it needs to pay for government services, or should government set public service budgets based on the amount of taxes collected? 3. Tax policy: Do you believe that taxes should be used to a) pay for government services, b) encourage/discourage business activity [business practices, hiring, wages, benefits], c) encourage/discourage individual activity [purchasing, spending, saving], and/or d) encourage/discourage individual behavior [health, exercise, speech]? 4. Social issues: Should government strive to a) create equal opportunity for all citizens or b) equal outcomes for all citizens [income, health, property, education]? 5. Native Hawaiian issues: Should government treat all people the same? When, if ever, is it okay to discriminate by race, gender, sexual orientation, or political or religious ideology? Or more specifically, what is our responsibility to atone for the actions of previous generations? 6. Health policy: Does government have the right to a) regulate the health care industry, b) provide health insurance coverage, c) require health insurance coverage, d) determine health care policies and coverage, and/or e) promote healthy lifestyles? 7. Foreign policy: Does government have an obligation to support other countries that are struggling with democratic principles? 8. Judicial policy: Should judges base their rulings on a) the US Constitution, b) personal experience, or c) public opinion, or d) International law? What questions would you ask Hawaii candidates? What issues are most important to you? “Hawaiians represent the compatibility of humans and we have a responsibility to teach that – but without preaching. Just watch us and we’ll show you: Let’s go dance! Let’s go surf! To me, this is the secret and beauty of Hawaii. It’s a marvelous, special place in the world. And now we have the job of passing it along to others. Because inside every one of us is a Hawaiian,” (page 67) says humanitarian Kenny Brown. 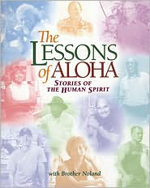 “The Lessons of Aloha: Stories of the Human Spirit” (1999) is a collection of 40 personal stories from people all around Hawaii, chosen by Hawaiian songwriter and performer Brother Noland, with photography by Shuzo Uemoto. * The Lessons Within – we learn about inner strength and determination from entertainer James Grant Benton’s commitment to breaking his drug addition and helping others; Sisters Offering Support founder Kelly Hill’s mission to helping women and children get out of prostitution; contractor Tom McNeil’s survival instinct that gets him through a hostage situation; drummer Kevin Delay’s triumph over physical handicaps with the help of determined parents and loving neighbors; MADD coordinator Donna Tyler’s appreciation for life and how she turned a personal tragedy into a calling; and Nancy Ishimoto and her son Shawn’s determination to be independent, despite his blindness. * Lessons in the Community – we learn about making a difference in the community from Women in Need founder Mary Scott Lau’s empathy as she teaches life skills to girls and unwed mothers; Word of Life Christian Center Pastor Chauncey Pang’s appreciation for everyone he meets; Kamehameha Schools graduate Kamani Kualaau’s courage to doing what is right when he helped set in motion huge changes at his school; Mercado de la Raza owner Martha Sanchez’s appreciation for the acceptance and welcome of Hawaii; Palama Settlement director Verna Keyes’ letting go of things and looking to the future; and educator Ken Yamamoto’s encouragement of BLT (Beauty, Love, Truth). * Lessons of the Land – we learn about appreciation and respect, from taro farmer Walker Ritte Jr.’s stand for what is right with peace and love; family man Moku Buchanan’s appreciation for family; builder and musician Reny Tsark’s leap of faith; wall builder Ralph Soken’s patience and self-discipline; rancher Charlie Onaka’s respect for hard work and success that is earned; conservationist Mac Poepoe’s respect for nature and other people; and retired plantation supervisor Karl Bader’s respect for workers by sharing meals. * Lessons in the Marketplace – we learn about helping others and seizing opportunities from architect and humanitarian Kenny Brown’s celebration of the Hawaiian in all of us; Network Media founder Peter Gellatly, who said “okay” when people asked for help – and committed to it; Foundation of I chairman Dr. Ihaleakala Hew Len’s teaching that “We are each 100 percent responsible for our own life”; Big Island Candies founder Pillan Ikawa’s focus on the importance of true relationships and trust; and Chun Ha founder Jonathan Lee’s decision to take a risk and create a successful commercial fishing business. * Lessons in the Arts – we learn about loving what you do and respecting yourself from Kali maestro Frank Mamalias’ use of kindness and respect to prevent fighting; master ukulele craftsman Sonny D’s open heartedness; Kendo Master Atsuo Nishioka’s lessons of respect, patience, and humility – not just winning tournaments; hula dancer Mae Akeo Brown’s passion for hula; music teacher Kupuna Martha Hohu’s patience, discipline, and respect for the truth; and feather lei artisans Mary Lou Kekuewa, who stopped drinking for love of her daughter Paulette Kahalepuna. * Lessons in Teamwork – we learn about leadership and teaching from coach and teacher Pal Eldredge’s decision to living one day at a time; coach and counselor Dean Kaneshiro’s transformation from teaching discipline to building self-esteem; Pop Warner football coach John Sharp’s lessons of discipline and consequences; basketball coach Dennis Agena’s honest and fair treatment of his players; and pro football veteran Blane Gaison’s focus on the future. * The Lessons of Kalaupapa (Hansen’s Disease) – we learn about appreciating what we have from residents Henry Nalaielua, who lived through fear and hopelessness; Clarence “Boogie” Kahilihiwa, who was determined to find out about the sister he barely knew; and Katherine Puahala, who focuses on the good things in life; as well as chef Shannon Crivello, who battled drug abuse until a nightmare made him accept his faults and regrets, and knows that he has a lot to teach. “The Lessons of Aloha” is inspiring and touching. It reminds us to appreciate what we have, instead of worrying about what we don’t have. It shows us that we can make a big difference in small ways. It makes us really think about what is important to us. How has the spirit of aloha touched your life? How do you inspire aloha in others? Tomorrow is Star Wars Reads Day! 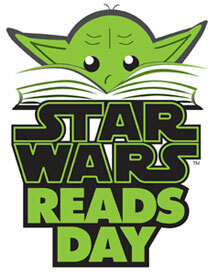 Saturday, October 6, is the first Star Wars Reads Day, a national event that celebrates reading and Star Wars. It’s a fun way to remember your favorite characters and scenes, and a great way to introduce your children to the adventure, space drama, and epic battles of Star Wars. Join the excitement at one of six Hawaii public libraries: Aiea Public Library, Aina Haina Public Library, Kahuku Public and School Library, McCully-Moili‘ili Public Library, and Mililani Public Library on Oahu; and Princeville Public Library on Kauai. There will be free activities like Star Wars coloring pages, trivia, bookmarks, prize drawings, and meet-and-greet opportunities with Star Wars costumed characters. Please call the host library for event times and details. Barnes and Noble at Ala Moana Center on Oahu will also host a special R2-D2 and Friends storytime on at 11 am with readings, crafts, and activities. For even more entertainment, download a free activity kit, filled with recipes, crafts, coloring pages, trivia, and games at http://www.starwars.com/reads/. “May the Force be with you.” And: May you read a lot of books. The general election is just one month away. If you’re like me, you’re tired of the roadside signs, radio and TV ads, “attack ad” complaints, and “gotcha” moments. In the midst of the campaign hurricane, let’s take a moment to appreciate how fortunate we are to live in a democratic country and how valuable our right to vote is. 1. Citizen Participation. Participation in government is both a right and a duty, whether it is paying taxes, being informed, voting in elections, attending civic meetings, or running for election. Note: According to the United States Election Project, voter turnout was 48.5% in Hawaii and 61.6% in the United States of eligible voters in the 2008 general election (the last presidential election). What does this say about how we value citizenship and our right to vote? 2. Equality. All people are valued equally, have equal opportunities, and may not be discriminated against because of their race, religion, ethnic group, gender or sexual orientation. Individuals and groups still maintain their right to have different cultures, personalities, languages and beliefs. 3. Political Tolerance. While the majority of the people rule, the rights of the minority are protected. People who are not in power are allowed to organize and speak out; and individual citizens must learn to be tolerant of each other. 4. Accountability. Elected and appointed officials must be accountable to the people. Officials must make decisions and perform their duties according to the will of the people and their own principles. 5. Transparency. A transparent government holds public meetings and allows citizens to attend. The press and the people are able to get information about what decisions are being made, by whom and why. 6. Regular, Free and Fair Elections. Elected officials are chosen and peacefully removed from office in a free and fair manner. Elections are held regularly. Participation in elections is not based on a citizen’s wealth, and there are few obstacles to voting. 7. Economic Freedom. Government allows private ownership of property and businesses, and the people are allowed to choose their own work and labor unions. Generally, free markets exist and the state does not totally control the economy. 8. Control of the Abuse of Power. Laws prevent any elected official or group of people from misusing or abusing their power. Frequently the government is structured to limit the powers of the branches of government: to have independent courts and agencies with power to act against any illegal action by an elected official or branch of government; to allow for citizen participation and elections; and to check for police abuse of power. 9. Bill of Rights. A bill of rights, which is a list of rights and freedoms guaranteed to all people in the country, protects people against abuse of power. It limits the power of government and may also impose duties on individuals and organizations. 10. Accepting the Results of Elections. In democratic elections, the losers in an election accept the election results peacefully. 11. Human Rights. All democracies strive to respect and protect the human rights of citizens, reflecting a respect for human life and human dignity. Examples of human rights include freedom of expression, freedom of association, freedom of assembly, the right to equality and the right to education. 12. Multi-Party System. A multi-party system allows for opposition to the party, provides the government with different viewpoints on issues, and offers voters a choice of candidates, parties, and policies. 13. The Rule of Law. No one is above the law, not even a king or an elected President. Everyone must obey the law and be held accountable if they violate it. Laws are equally, fairly and consistently enforced. Are all of these principles of democracy at work in Hawaii? In the United States? Do we have an obligation to support other countries that are struggling with democratic principles? You are currently browsing the Better Hawaii weblog archives for October 2012.